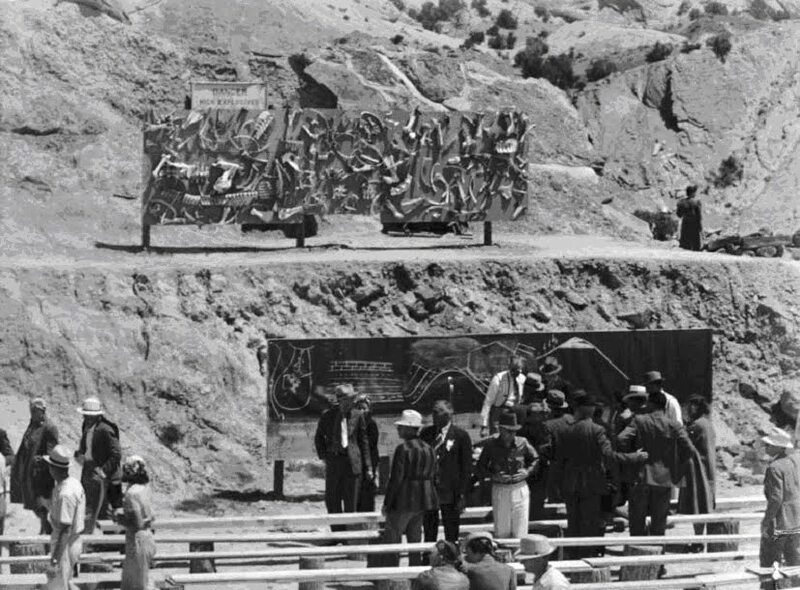 The Vernal branch of Lion’s International had long been a strong supporter of the development of Dinosaur National Monument. 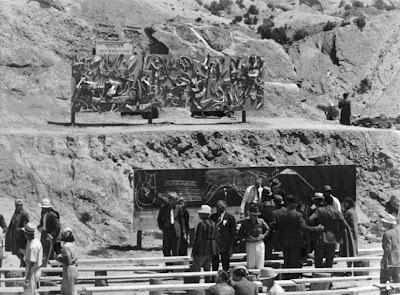 At least as early as 1932, only eight years after all digging had ceased, they were lobbying Congress for funds to reopen the excavations and build facilities. 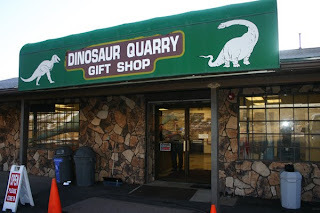 On the Sunday following the end of the meeting, the group made a trip to Dinosaur National Monument to see the great dinosaur quarry first hand. 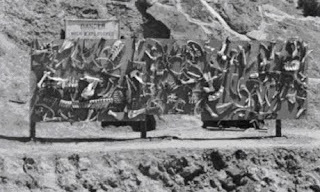 In 1939 the Monument excavations were still stalled because of lack of funding, so they did not see the spectacular wall of bones most readers are familiar with. Nevertheless, the National Park Service put on a show. 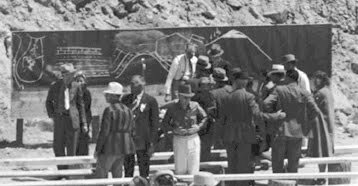 In an area to the east of the actual quarry, benches were set up and a presentation was given, although I haven’t been able to uncover any details about what was said. However, Vernal resident Mr. L.C. Thorne, captured the moment in a fascinating photograph reproduced here. In front of the benches for the audience, is a large blackboard. On that is a geological cross section (of sorts). The hill drawn in chalk on the right side of the board is the Carnegie Quarry hill. Immediately left of that hill, partially obscured by a gentleman wearing a white shirt and suspenders, is the outline of a building --- a sketch of what would eventually be the Quarry Visitor Center. Behind the blackboard and at a higher level is an interesting interpretive feature --- a large board with dozens of cow bones and skulls mounted to it. 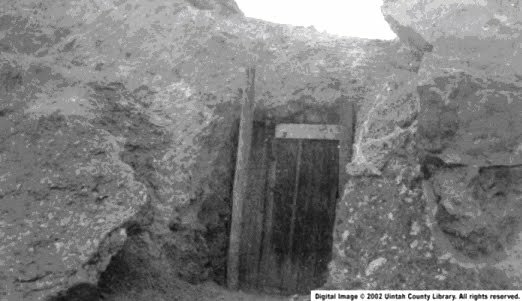 Obviously this is to give the visitor an idea of what a bonebed is like and to probably conjure up an image of what lay still locked away in the unexcavated part of the quarry. Finally, and in some ways most intriguing, is a small white sign projecting slightly above the wall of cow bones. It’s actually not part of the cow bone exhibit, but rather is mounted on the rock outcrop behind it. Although difficult to read at the size posted here, the original shows that it reads “DANGER HIGH EXPLOSIVES”. While this may seem odd, the next photo, of much older vintage, is of the room excavated into the rock that served as the dynamite storage spot during the historic excavations up to 1924. 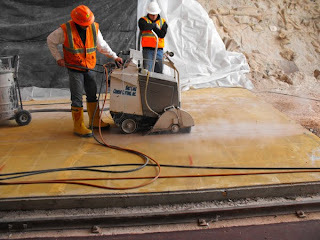 The Works Project Adminstration did a project at Dinosaur removing mudstone and exposing the upper surface of the 20-foot thick Carnegie Quarry sandstone and they may have used explosives during this time. Was the room full of explosives during the Lions Club visit? 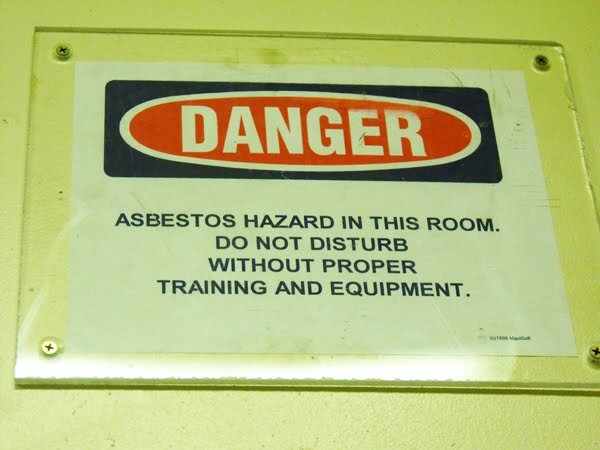 I don’t know, but why such a sign would be up otherwise is a bit baffling. What we DO know is that the Lions Club members each left in one piece. (1) “Lions Meet Ends with Visit to Dinosaur Quarry”, Vernal Express, June 16, 1939, pages 1, 4. All photos in this post courtesy of Uintah County Library Regional History Center. The date for the move was known well in advance, so there was plenty of time for the planning. The space required for the collections to be housed in was calculated and additional storage cabinets and open rack shelving was purchased so overcrowding could be avoided. Every fossil was carefully wrapped and packed along with its associated data in boxes labeled as to cabinet and drawer. 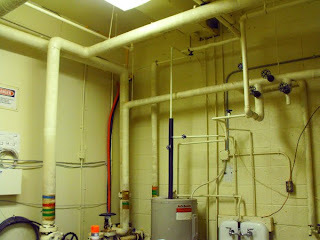 The new collection space was painted, made secure, and radon control systems were installed. New office space was more than adequate, and file cabinets, desks, fax machines, lighting, computer and telephone networks could be moved with barely a disruption to the operations. Moving arrangements were made. Everyone was prepared and ready to go well before the day the moving began. Whoa! Was I dreaming? What was I thinking? 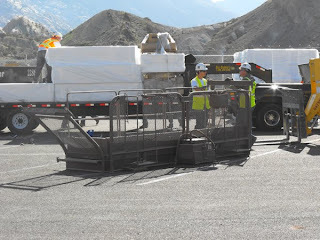 The move out of the Quarry Visitor Center was less than ideal and a bit more rushed. In July of 2006, after analyzing new data, engineers told us the building we had occupied for 50 years was in danger of imminent collapse, that we were playing Russian roulette allowing anyone is the building, and we had to evacuate within 48 hours. Besides the simple rush of getting all the stuff out a building, the question was where to put it. The QVC had served not only as an exhibit hall for the Carnegie Quarry, but also as the point where visitors first came when arriving in Dinosaur. So the interpretive operation took over a small building at the bottom of the Carnegie Quarry hill, a building not designed for interpretive purposes. This became informally known as the Temporary Visitor Center. 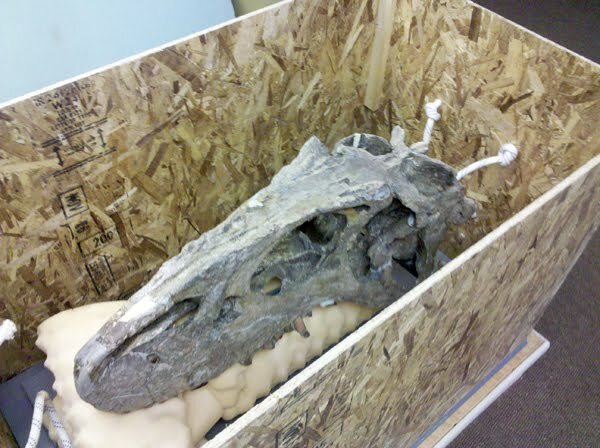 It was the only building available at the time of the move. 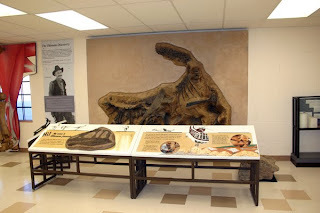 Over time we put together some interpretive exhibits and a few fossil displays for our greatly reduced visitation. So everyone was excited when the new project was funded. 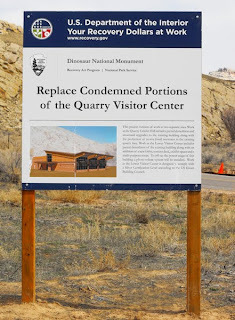 Not only would the Quarry Visitor Center housing the Carnegie Quarry be completely redone, but the Temporary Visitor Center will be expanded, remodeled, and ultimately serve to introduce the public to the diverse resources in the Monument. 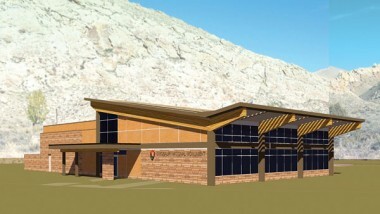 In other words, it would become a typical NPS Visitor Center. The problem was that remodeling and reconstruction was so extensive that this building also had to be evacuated. So where to move the operation? There were no more unoccupied buildings in the Monument. Fortunately, an old tourist shop immediately outside the entrance to the Monument had been vacated and became available to serve as a temporary temporary visitor center. 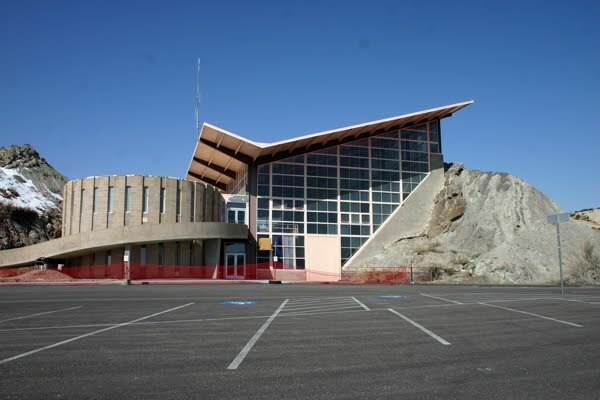 So in March of 2010 the people and operations in the old temporary visitor center moved into the new temporary visitor center, but only after this latter building had been cleaned, repainted, refurbished, and had security and fire suppression systems installed. We’ve been able to put in some paleo exhibits and the Monument book store has relocated with us. 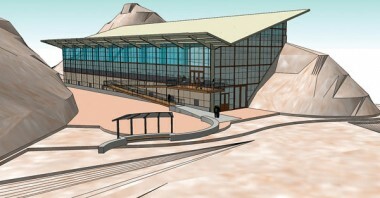 This will be the visitor center until the Fall of 2011 when everything will go back into the new PERMANENT visitor center. 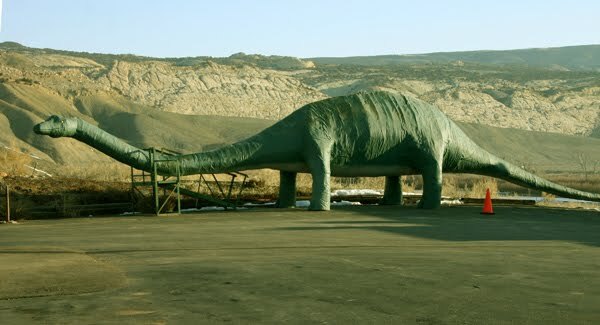 For the summer of 2010 entrance fees will be waived and admission to Dinosaur will be free. 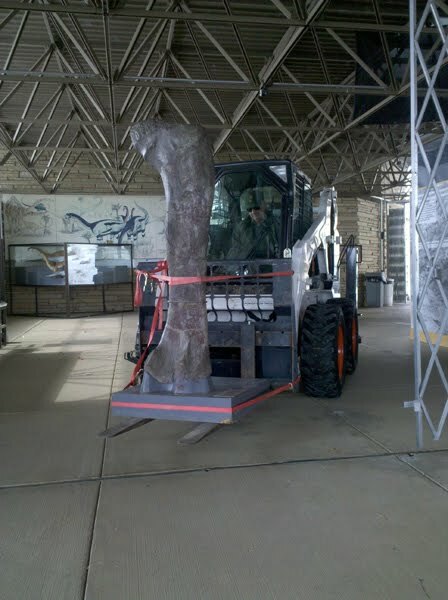 So while we are at our present temporary location, stop by and take a ride on the hyper-realistic sauropod reconstruction. It is so unnervingly real that you’ll swear you saw it move! 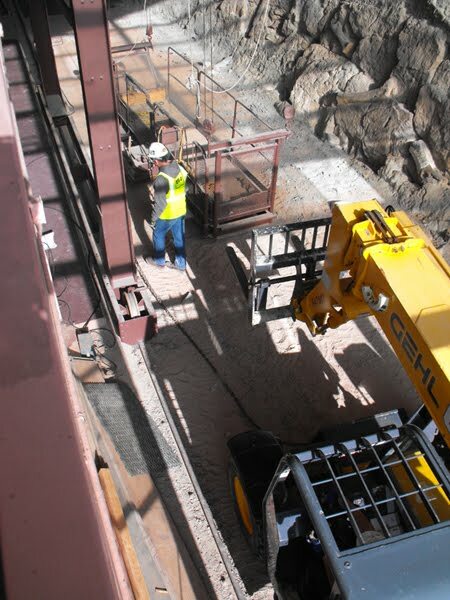 One of the major structures within the QVC is the huge rolling crane that was originally used as a drilling platform when excavations were being done inside the building. 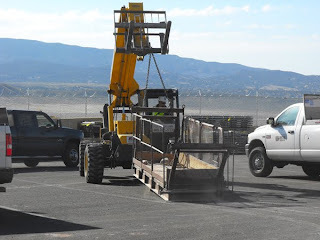 Air lines for jackhammers ran to the large basket that was the work surface and blocks drilled off the face were slid onto the basket to be lowered to the ground and dumped. Heavy equipment then hauled these blocks out of the building. In later yeas the crane and basket took on other duties, serving as a work area for paleontologists who needed to study specimens exposed on the many steep areas of the quarry face. 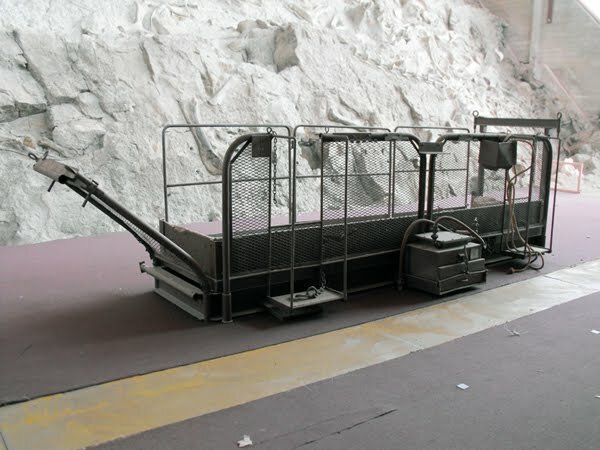 It was also used as a work platform for curatorial activities, such as numbering, cleaning and repair. 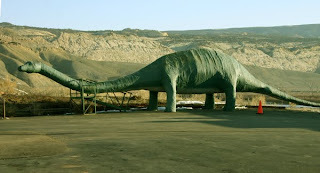 Some readers may remember the experience of being on the basket and examining the spectacular Camarasaurus skull on the top center of the cliff face.Being fifty feet above the ground and looking across the ancient river bed strewn with bones is something not easily forgotten. For reasons I’ll discuss in a future post, the crane and basket will not be part of the QVC.The basket and crane were rolled to the east end of the QVC and the basket lowered down to the ground one last time. Heavy equipment dragged it out of the building and into the parking lot, where it awaits recycling. “Well getting the basket out is the easy bit ” you say, “but HOW will you remove the crane?”You shall find that out in the fullness of time, constant reader.I don’t want to give away that surprise quite yet. 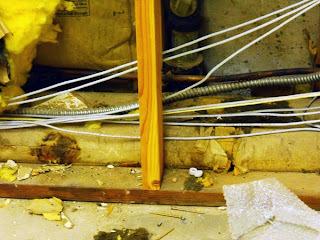 The QVC is full of obvious hazards, from hanging walls of glass to bent vertical steel beams and collapsing ceilings. However, other more subtle dangers exist throughout the building. Remember, the QVC was built during 1957-1958. Those were times of less knowledge about environmental and health issues relative to building materials. What was standard fare at that time is now known to be a threat that needs to be mitigated or eliminated. Here are two prime examples. 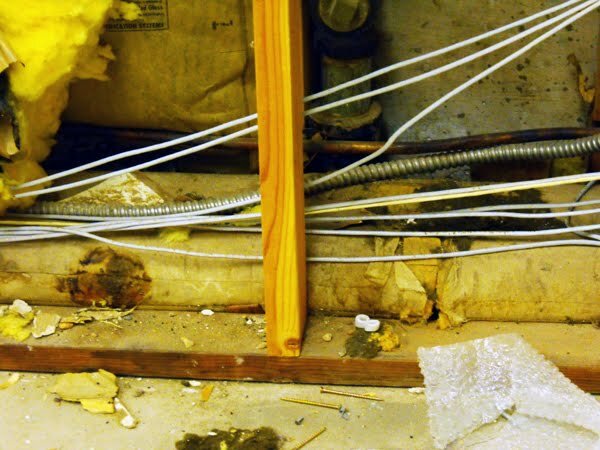 Asbestos was widely used for insulation around heating pipes, as well as in drywall mud, floor tiles, etc. It was even used as a filled in adhesives used on some of the bones on the quarry face. 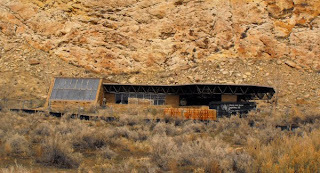 The administrative wing of the Quarry Visitor Center has considerable asbestos in it, especially around piping in the furnace room and the heating system that runs throughout the building. Those areas will need to be sealed off, kept under negative pressure, the workers removing the asbestos will work in “moon suits”, and wash off in a shower room before getting out of the suits. 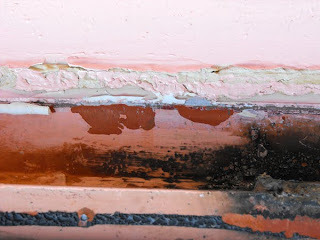 The QVC has been through a number of repaintings and almost every part of the structure bears multiple coats of paint dating back to 1958. Paint in the 1950s was predominately lead based, so demolition, recycling, and reuse of materials requires the safe removal and disposal of the paint. As the QVC project proceeds, abatement teams will be working throughout the building grappling with asbestos and lead paint problems. Those threats will need to be eliminated before demolition or construction can even begin. One the unusual opportunities offered to the public at Dinosaur is the chance to go up to the quarry face and touch the bones. 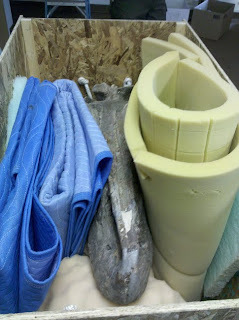 This is not a “touch bone” sauropod femur set up on a table in an exhibit hall. Here visitors can touch any of a number of bones just as the were deposited 148,000,000 year old sandstone on the bottom of the river channel. Fortunately, a Diplodocus left major parts of its skeleton on the upper surface of the sandstone at about waist level, so touching is easy for children and adults. In order to keep visitors touching only the most durable bones, we poured a cement pad up to the cliff face and fenced in the sides of the pad. 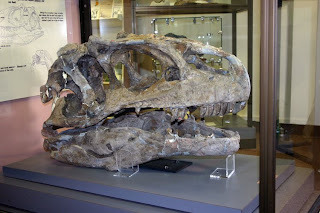 This bone touching experience was the high point of a trip to Dinosaur for millions of visitors. 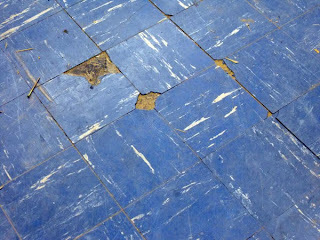 However, when the rehabilitation of the Quarry Visitor is completed, the building will have an entirely new floor system. 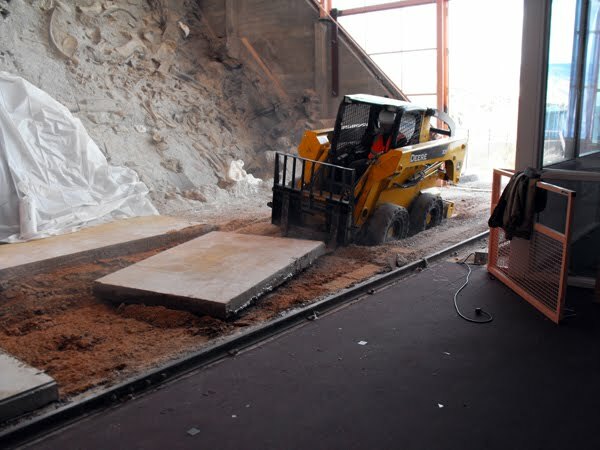 This requires removing the six inch thick cement pad running to the face. The photos in this post illustrate the major steps. Because the pad runs up to the face, removal presented some problems in terms of protecting those Diplodocus bones. First the carpet was pulled up. 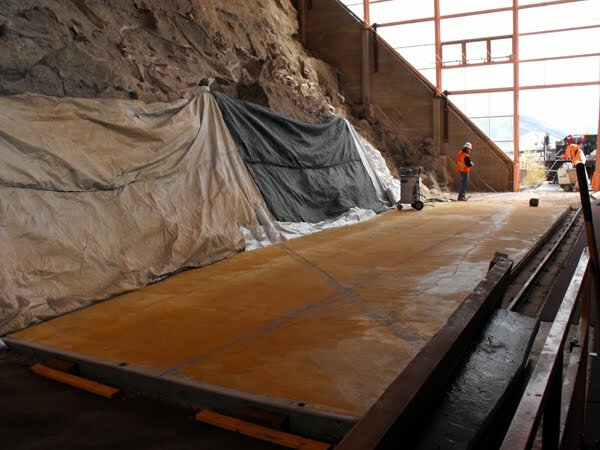 Since power tools and heavy equipment were required for concrete removal, the quarry face and bones in front of the work area were draped in blankets and plastic for protection. 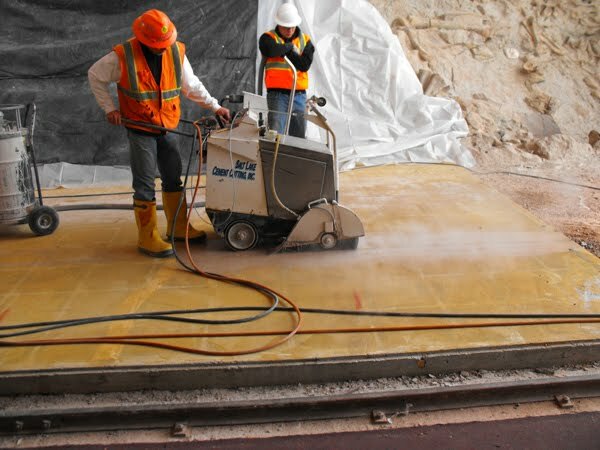 A water lubricated cement cutting saw unit made several passes per cut to go all the way through the pad. The pad was cut into a number of 6 foot x 4 foot slabs. 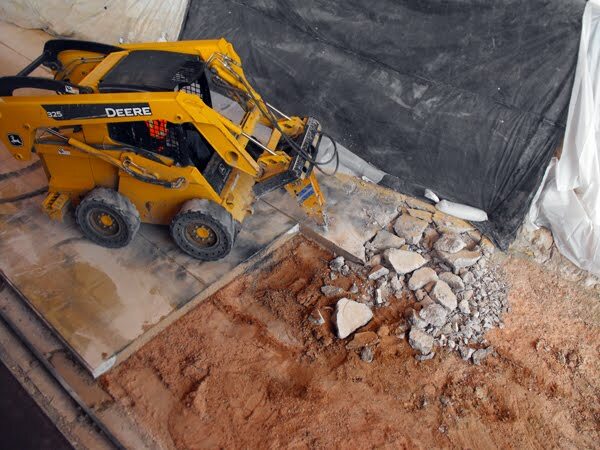 At first a small bobcat hauled the slabs away, but it soon became trapped in the unconsolidated soil within the building. 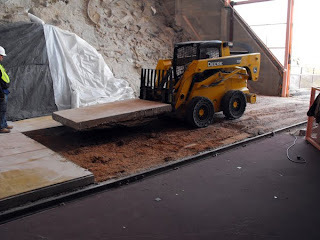 Thus a larger and more powerful piece of machinery was used to haul out slabs. 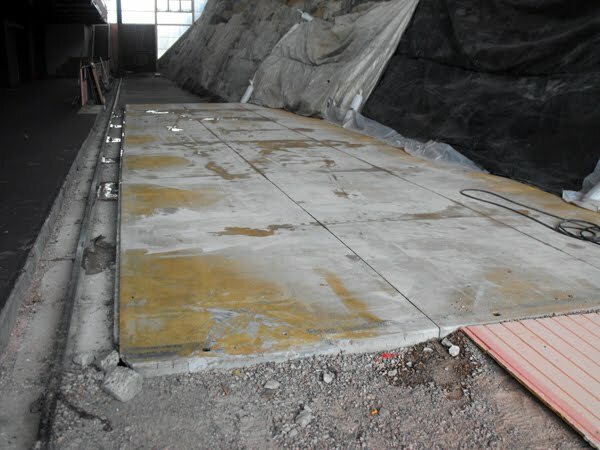 However, the 3 foot wide strip of concrete running along and contacting the quarry face was more obstinate.That section was reinforced with rebar. To break this into smaller pieces a mechanized pneumatic drill was brought in.This was deftly maneuvered close to the quarry face and eventually the strip was reduced to rubble that could be loaded by hand and taken out of the building. From start to finish the process took about 7 hours, but the pad was eventually removed and the bones no worse for the wear. I have done several posts on the poor condition of the QVC, so an explanation of how this will be fixed might be in order. 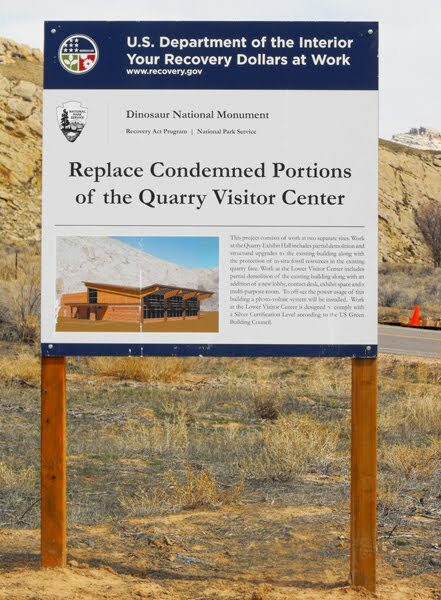 The Quarry Visitor Center protects and provides access for the public and the scientific community to some 1,500 dinosaur fossils preserved in-situ in a sandstone layer. The QVC encloses the quarry, which in-turn forms the north wall of the building. 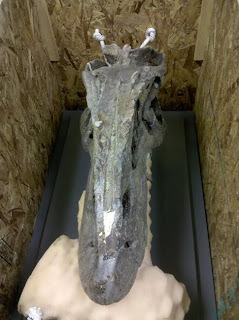 Expansive glass walls on all sides allow for ambient lighting of the bones. The QVC opened to the public in 1958. 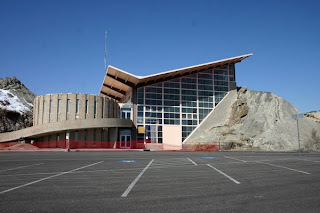 In 2002, the building was declared a National Historic Landmark due to its significant representation of American Architecture and National Park Service history. However, the facility was closed in 2006 due to challenging subsurface conditions, including expansive clays that caused the building structure to deteriorate. 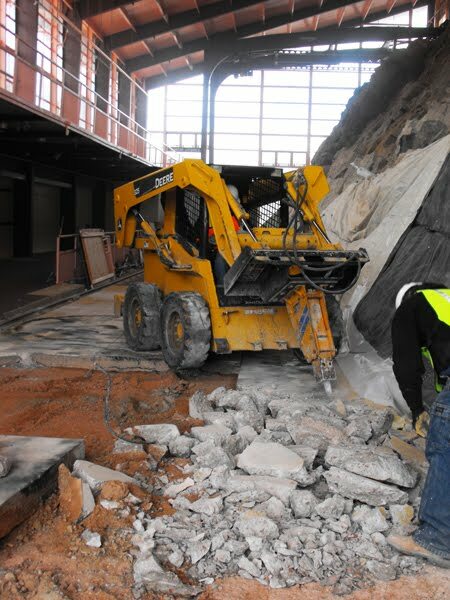 In 2009 the NPS received funding under the American recovery Act Program (aka the “Stimulus Bill”) to repair and rehab the QVC. The rehabilitation of the facility requires careful protection of those building elements that will be conserved in the course of selective demolition, protection of exposed building components, and the integration of new construction. The project will also include installing micro-piles under the existing structural elements of the Visitor Center, removal / replacement of major structural elements, and monitoring the integrity and safety of the overall structure as the work progresses and portions are demolished and replaced. The familiar cylindrical building, outside ramps, and administrative wing (formerly housing office, lab, and collections area) will be demolished and will not be rebuilt at this facility. 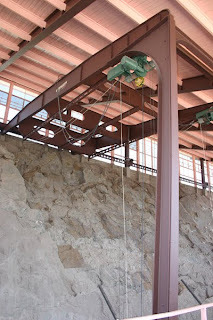 Work will focus on stabilizing and rehabilitating the glass walled structure enclosing the quarry face. 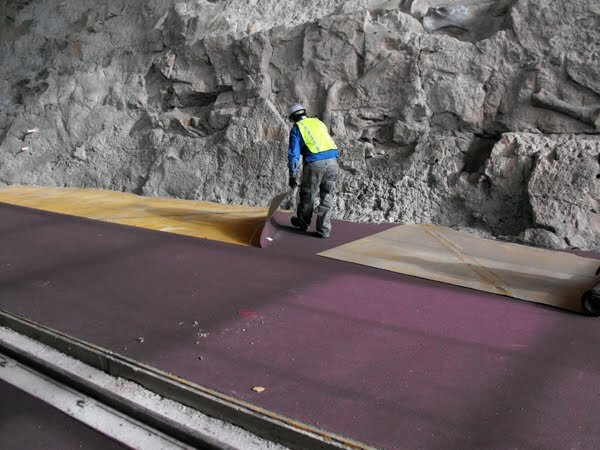 Because construction activities will occur above and around the quarry wall, protection of the quarry face from the elements, dust, vandalism, theft, and rodents during construction is of utmost importance. Design is already underway for totally new exhibits for the refurbished QVC. In addition to the QVC project, work is also underway on the remodeling, enclosing, and expanding of the lower Temporary Visitor Center. The existing facility is composed of several detached masonry structures connected by an open-air, space-frame, roof structure. The remodeled structure will serve as a Visitor Center for the entire park and contain exhibits on the Monument’s rich and diverse resources, paleontological, geological, biological, and cultural. Pictures of the old buildings and architectural renderings of their new versions are given above. 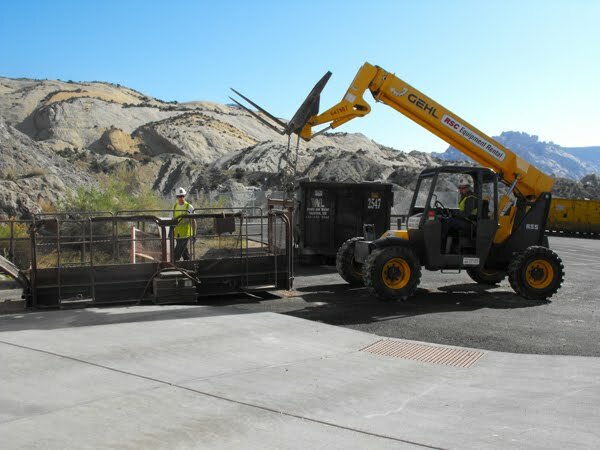 Big-D Construction is the key subcontractor in a teaming arrangement with Advanced Solutions Group for the Dinosaur National Monument project.